This is Part 1 of a 4-part patent landscape analysis for cell-based meat. In this series, I’ll summarize every major patent about cell-based meat, the technology covered, and what it means for the industry. A major benefit to studying the patent landscape is learning about what companies are working on. There’s usually more technical detail in patents than what companies talk about publicly. Another benefit is that if you’re starting a new cell-based meat company, you need to understand the landscape to develop your own strategy. For example, where do you have freedom to operate? What areas are under-explored? What areas should you stay away from due to heavy existing patenting? Keep in mind that, while this analysis is a good starting point, there will be other work in tissue engineering, manufacturing, food science, and other fields that will be relevant to your process. The obligatory caveat: I am not a lawyer, just someone who likes reading patents. Please don’t take anything I say as legal advice. Memphis Meats has two pending patent applications, both around genetic engineering. Even though most cell-based meat patenting is focused on engineering and manufacturing, Memphis Meats’ applications are focused on molecular biology. Interestingly, both patent applications describe technology that would yield GMO meat. This could indicate that Memphis Meats is considering making their end product GMO, or that they are using genetic modification as a research tool . This patent application discusses a method of genetically engineering a cell line to easily control when cells proliferate or differentiate. Instead of using expensive growth factors to control cell behavior, Memphis Meats modifies the cells so that they can replace some growth factors with small molecules. This could drastically lower media costs, which is the main cost driver for cell-based meat. The main downside is that it yields GMO meat. Figure 3 in the patent application. Box A represents the proliferation media, which contains DOX but no E2. Box B represents the differentiation media, which contains E2 but no DOX. The technology is based on a “double-switch” mechanism. Proliferation is switched on in the presence of one particular small molecule, and differentiation is switched on with another. The two switches both use well-known induction systems, but the patent application describes a novel way of combining them. The first switch uses a Tet-On system of expression which involves allowing transcription only in the presence of the small molecule doxycycline (DOX). The cell line is transduced with a vector containing POU5F1 and KLF4, a pair of genes known to preserve self-renewal in their pig model cell line, called O2K . The activator for these genes is then turned on when DOX is present in the cell culture media. Memphis Meats can therefore switch on the expression of POU5F1 and KLF4, and hence the proliferation of the cell line, by adding DOX to the media. The second switch uses a β-estradiol induction system. 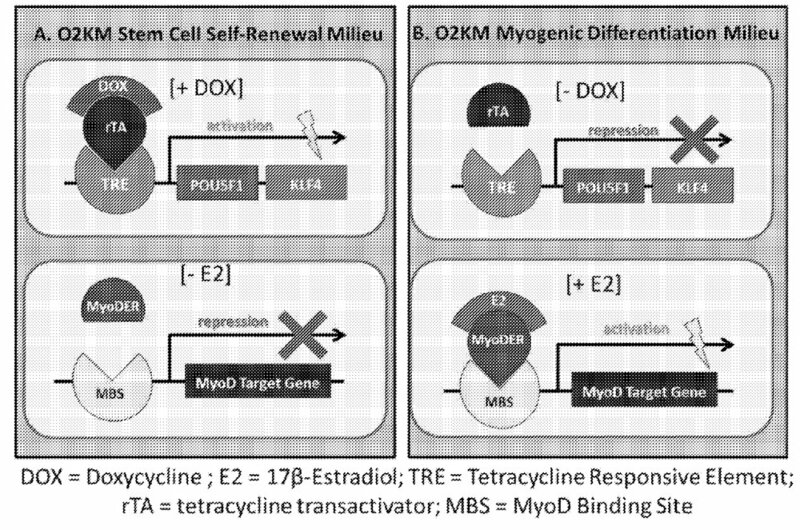 For the O2K cell line, the transcription factor MyoD naturally triggers myogenesis. Memphis Meats ectopically expresses a fusion of the proteins MyoD and human estrogen receptor α (ERα). The ERα part of the fusion protein inactivates the MyoD part until exposed to the small molecule 17-β-estradiol (E2). E2 binds with ERα, allowing MyoD to perform its transcription factor function. Memphis Meats can therefore induce terminal myogenesis by controlling the presence of E2 in the media. Figure 2 in the patent application. Schematic representation of the double-switch strategy. Combining these two systems allows Memphis Meats to use DOX and E2 to control behavior of the O2K cell line. They start the cells in a DOX-containing medium to induce proliferation, then later switch to an E2-containing medium to induce myogenesis. They also include the GSK3B inhibitor CHIR99021 in both media to prevent cell death while transitioning from the proliferation to the differentiation phase, and the DNA methylation inhibitor 5-Azacytidine (5AC) in the differentiation media to help terminal differentiation. Claims : While the body of the application covers the version of the double-switch system involving the O2K cell line, and the cell control program using DOX, E2, CHIR99021 and 5AC, the claims are much broader, and protect the entire double-switch strategy. This includes any process which genetically modifies a self-renewing cell line so that it’s possible to exogenously induce proliferation, and separately exogenously induce myogenesis. The application has not been granted yet, so the claims may change if the patent office determines they are too broad. I expect this to be an appealing strategy for companies using GMOs since it for allows control over cell behavior while lowering the cost of the media by eliminating expensive growth factors. This could be useful for scaling up a process, or as a research tool for working with myogenic cell lines. This patent application describes a novel way to immortalize a cell line using genetic engineering. It builds on an existing method of immortalizing myogenic cell lines by overexpressing telomerase reverse transcriptase (TERT) and cyclin-dependent kinase 4 (CDK4) . Memphis Meats’ innovation is that instead of overexpressing CDK4, they use CRISPR to knock out a protein that naturally inhibits it. This allows them to immortalize cell lines without having to ectopically express CDK4. The CDK4-inhibiting genes that Memphis Meats targets are CDKN2A for chicken cell lines, and CDKN2B for cow cell lines. Memphis Meats uses CRISPR to knock them out by making small insertions at the locus of each gene, causing frameshift mutations. The tumor-suppressing proteins p15 and p16 are then no longer expressed. Since these proteins naturally inhibit CDK4, their absence has the same end effect as ectopic expression of CDK4. It seems like the main benefit of this method is that it uses gene editing over genetic modification—instead of adding an entirely new gene to ectopically express CDK4, it makes a small modification to a gene that already exists in the cell. This could be favorable from a regulation standpoint, given existing precedent in plants. There’s still a lot of uncertainty over how cell-based meat will be regulated, but crops that are merely gene edited are not considered GMO (unless you’re in Europe ). Claims: This patent application protects any method of immortalizing a cell line for meat that involves ectopically expressing TERT, and using genetic engineering to knock out any cyclin-dependent kinase inhibitor (e.g. CDKN2A and CDKN2B). Again, the claims are much broader than the technology discussed in the patent application. This patent application is relatively new, meaning that the claims might get narrower during the review process. Interestingly, the independent claim of the application specifies that the TERT must be ectopically expressed. This means that this patent application only protects processes that would yield GMO meat, even though the main benefit of the application is that it uses gene editing instead of genetic modification. If you increase TERT levels in some other non-GM way (e.g. serial passaging a cell line and selecting for clones with high naturally TERT expression), you could create a non-GMO immortalized muscle cell line that wasn’t protected by this application. There could also be a different benefit to this method that’s not explicitly discussed in the patent application. Just has two very broad granted patents. Rather than covering a technology whose intended application is making cell-based meat, they both cover the entire process of cell-based meat production. Just acquired both patents when it started working on cell-based meat , meaning that the patents don’t tell us much about the technology that Just is developing. This patent was filed by Willem Van Eelen, one of the early pioneers of cell-based meat who came up with the idea while in a prisoner-of-war camp. He worked on the idea fervently for his entire life, but died before seeing his vision become a reality . The possibility that Just may finally implement his vision is a compelling and beautiful story. Indeed, I think the patent’s history and story is its main asset–the technology it describes won’t be very useful. The patent discusses technology to make 3D tissue by seeding cultured cells onto scaffolding. However, the patent describes a very early iteration of this technology, and doesn’t contain any technical insights that are relevant today. The patent is also not written in the careful legal language that you find in other patents. The claims make a number of qualifications that make them easy to engineer around. For example, they explicitly require the tissue to be three dimensional, and contain no fat. Given that early products will likely be ground meats that use fat for taste, I don’t believe this patent will give Just much protection. This patent also covers the entire process of creating cell-based meat using scaffolding, but is stronger than the Van Eelen patent. It covers any process of making food by culturing cells ex vivo, then seeding the cells onto a support structure. It was granted in 2004, meaning that it technically gives Just protection on the entire cell-based meat process. Current cell-based meat startups are all likely infringing on this patent. It expires in 2022, which is after many companies plan to commercialize their first products. Wayne Szeto, the head of IP at Just, said “We’re open to having discussions around licensing. This is not going to be ‘play with us or don’t play at all,’ not in that black-and-white way.”  Given the uncertainty over Just’s plans, startups should be aware of this patent as they plan out their next couple of years. The patent might be too broad and turn out to be invalid. Many, if not most granted patents would turn out to be invalid if tried in court . However, the patent is presumed to be valid until someone decides to challenge it. Just could grant cheap licenses to other cell-based meat companies instead of trying to block out competitors. Initial products that come out before 2022 might not use scaffolding, meaning that they wouldn’t infringe on this patent. For example, they might use bioprinting instead. There are two interesting points discussed in the patent body beyond the basics of cell-based meat. The first is using cultured cartilage as a scaffolding. The second is a method to make meat healthier by ectopically expressing enzymes that synthesize nutrients like vitamin D, or vitamin A. Claims: A process of making food that involves culturing muscle cells ex vivo, and seeding these cells onto a support structure, e.g. scaffolding. Let me know your thoughts in the comments section or contact me directly at robert.e.yaman@gmail.com. Part 2 will discuss Future Meat’s strategy of distributive manufacturing with small bioreactors. Stay tuned! Reminders: Cell-based meat definitely doesn’t need to be GMO. Also, GMOs are totally safe to eat. Derived here: https://www.ncbi.nlm.nih.gov/pmc/articles/PMC3190702/. Also used in some of Memphis Meats’ other work–see https://www.nature.com/articles/srep41833. At the end of each section, I’ll briefly cover what is claimed in the patent (i.e. what parts of the technology the patent legally protects). This is to make it easy for companies to know if they might be infringing on the patent. They won’t be as relevant if you are just interested in learning about the technology. Sometimes, I’ll talk about both dependent and independent claims, meaning that the independent claim may actually be slightly broader than I indicate. If you’re worried you might infringe a patent, definitely check the patent yourself or consult a lawyer.